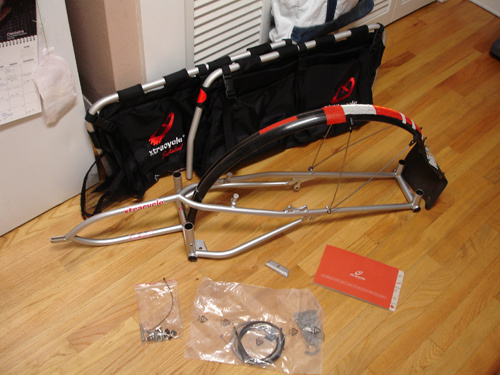 Last week, we presented the first part of an Xtracycle build…and left off with the attachment of the rear wheel. 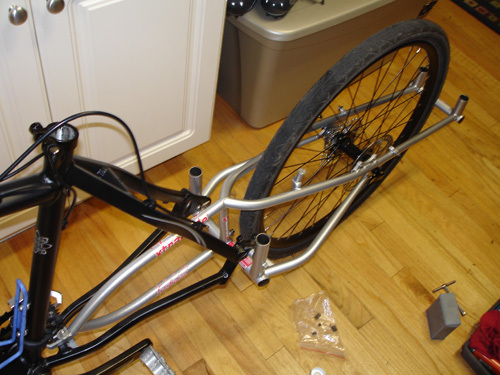 The rest of the assembly is fairly easy, as long as you are comfortable measuring, cutting and running new cables and casings and adjusting brakes and shifting systems. Otherwise, a trip to your local bike shop might be in order for professional assistance. Let’s finish this thing up, shall we? 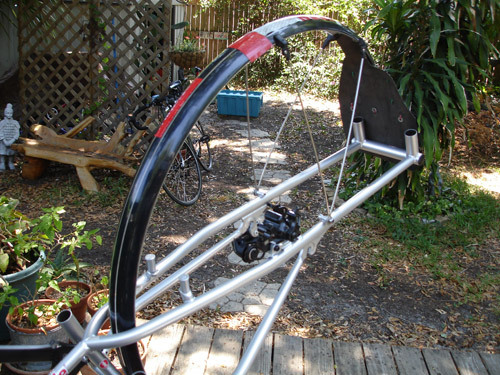 For those of you running disc brakes with your Xtracycle, the FreeRadical kit requires an 203mm/8″ rotor on the back wheel. So, a disc swap is needed if your rotor is smaller than the requirement. 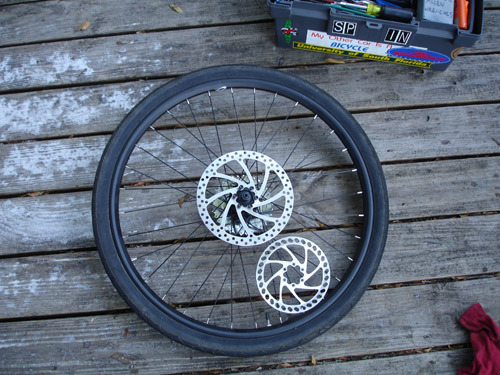 Pop the back wheel out of the FreeRadical and replace the disc with a larger one. Whatever you do, DON’T do what I did — in my excitement, I didn’t seat the Torx T25 wrench deeply enough in one of the rotor bolts and rounded it off. So, I spent an extra hour trying to remove the bolt…first with a slightly larger Torx key, then a drill and a “screw out” bit. Finally, after nothing else worked, I cut a large screwdriver slot in the remains of the bolt head and eased it out with a hammer-powered impact driver. Now, it’s time to string some new cables. First, measure and cut an appropriate length of casing for the rear brake. 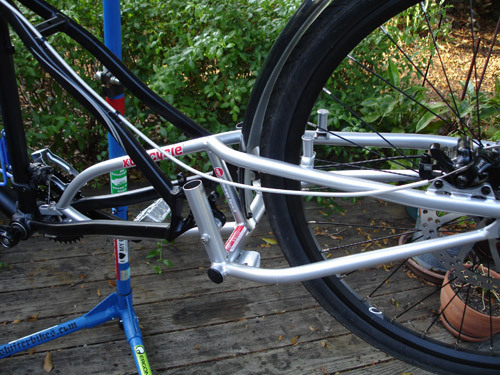 Install it using the bike frame’s cable guides and extra zipties if needed. Run the cable through the casing and attach it to the rear brake. If there’s a way, see if you can keep the casing one continuous piece — that lessens water intrusion and the inner cable will last longer because of it. This isn’t an option on all bikes, but with a few extra zipties, you might be able to pull it off. On the other side of the bike, measure and cut appropriate lengths of derailleur cable housing and run them back to the rear derailleur. 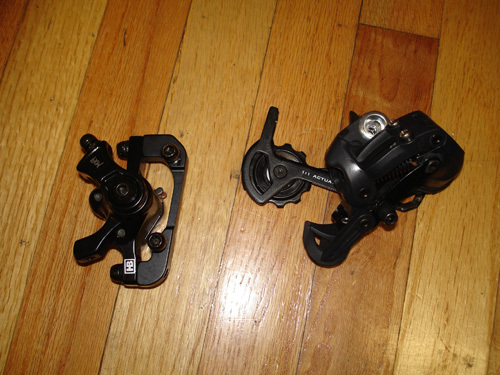 Thread the inner shifter cable through and attach to the derailleur. 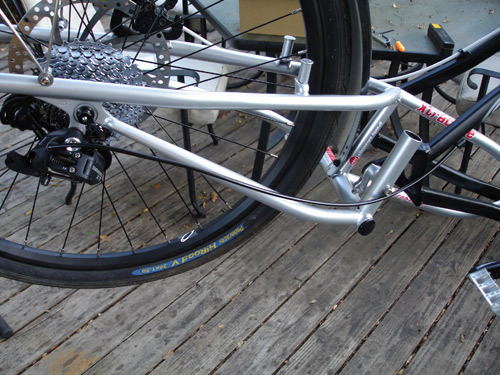 Most of the time, the cable housing will be cut into several pieces to run between cable stops on the bike’s and the Xtracycle’s frames. 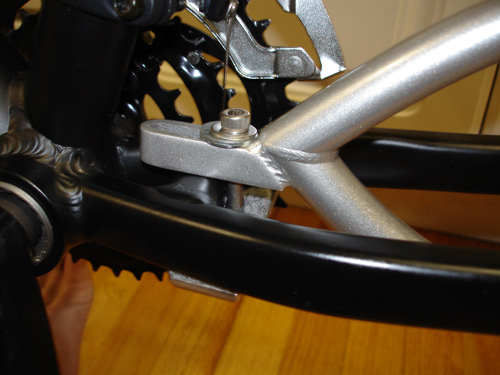 You may need a couple zipties to keep the casing secure as it travels back to the derailleur. Finally, be sure to use “linear” housing for the derailleur to ensure crisp shifting…it’s a long run of cable and any slop will be magnified if you just use brake casing. 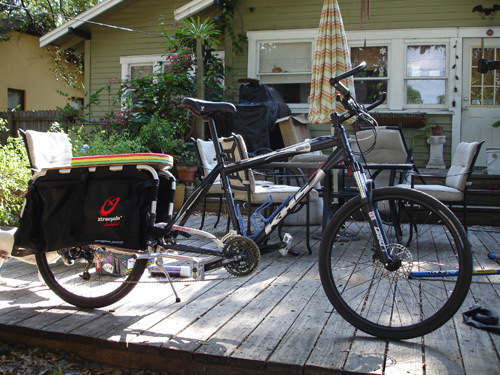 Xtracycle supplies lengths of the appropriate casings for each application in the build kit, though, so don’t worry! 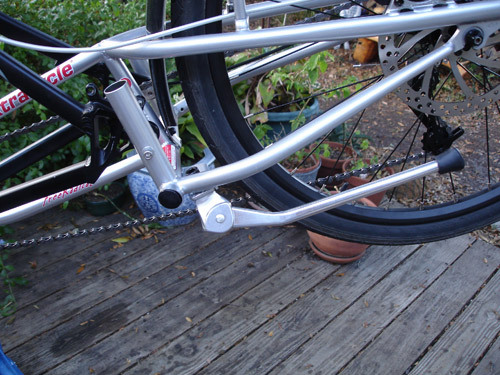 Next, add the Xtracycle-supplied piece of chain to your bike’s existing chain and size the chain for your application. If you’re not familiar with proper chain sizing technique, the folks over at Park Tool have an excellent tutorial. I wound up using all but one complete link of the extra piece of chain for my build. Guess what? All the tricky building steps are behind you! We’re in the home stretch now, so take a break, crack open another beer if that’s your thing and relax for a few minutes. Ok, now it’s time to adjust the brakes and rear shifting mechanism. Again, if you’re not familiar with these tasks, Park Tool comes to the rescue again with a derailleur/shifter adjusting tutorial and a good series of brake tutorials. 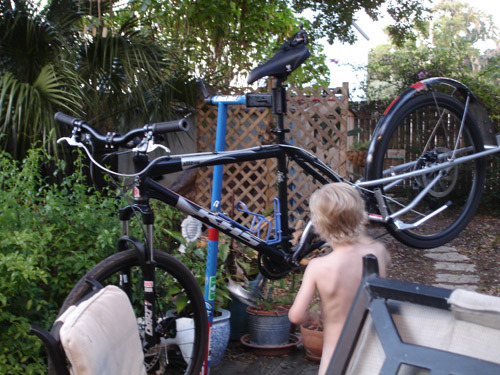 Here’s a completely optional step — get your “house elf” to doublecheck the drivetrain for smooth performance. Despite his lack of clothing, he gave the drivetrain a thumb’s up. It worked flawlessly! 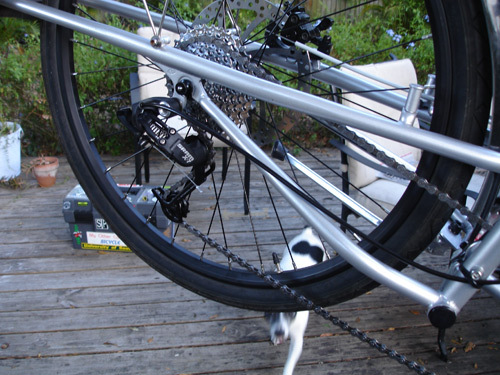 Make sure the rear derailleur shifts cleanly and the brakes do what they’re supposed to do, then pull the bike out of the stand and rest the assembly on the kickstand you installed a little while ago. Now, slip the V-racks into the upright sockets of the FreeRadical frame, strap the attachment straps in their appropriate places (consult the Xtracycle assembly instructions for specifics — it’s not as intuitive as it sounds, and proper strapping is crucial to a long bag life), snap on the Snapdeck and voila! You have just completed your Xtracycle build — congratulations!!! All that’s left now is to go for a spin. If you’re anything like me, you’ll return from your shakedown cruise with a huge grin on your face! The staff here at Bikecommuters.com strongly advocate bike commuting as one of many ways of reducing our impact on the environment, but we also really encourage utilitarian cycling such as grocery shopping, errand-running, date nights, etc. We feel that the amazing Xtracycle facilitates such a lifestyle…this baby is designed to do just about everything a car can do — hauling people and packages in a friendly, healthful, low-environmental-impact sort of way. That being said, we’ve gotten a few questions submitted to us in the past couple months along the lines of “you know, I’m really interested in getting an Xtracycle…how hard are they to put together?” So, we figured we’d do a (mostly) step-by-step photo tutorial with tips and tricks for getting one of these beauties up and running. And, because this tutorial is photo-intensive, we also figured that it would be better as a two-part article. Xtracycle kits come with a well-prepared and clear assembly instruction booklet, but it is always nice to see some additional photos and hear about some of the “ins and outs” of such an assembly. So, let’s get down to it! and combine them to be a fully-functioning utility bicycle? It’s not as hard as you think…if I was pressed, I’d rate it as no more than an intermediate-level mechanical endeavor. If you’re comfortable replacing cables, adjusting brakes and shifting systems on your bike, the rest of this setup will be a piece of cake. However, if you’re not comfortable with such things, leaving it in the hands of a professional might be a better course of action — after all, you won’t ride it if it doesn’t work well, right? Right off the bat, please let me recommend that you visit your local bike shop and purchase a “tandem-length” (3000 mm) brake cable with the appropriate leaded end for the type of brakes you’ll be using on your build. Although the good folks at Xtracycle include a long brake cable in the build kit, it was over 4″ too short for my application, resulting in a mid-build trip to a faraway bike shop that had tandem cables in stock. If for some reason you don’t actually need such a long cable for your build, rest assured that it wasn’t a wasted trip; you can use it next year when it is time to replace your cables. Also, you may strongly consider prepping the interior of the FreeRadical frame with Boeshield, FrameSaver or plain boiled linseed oil — there are some tubes that could potentially collect rainwater, and you don’t want this great machine rusting from the inside out. Simply plug all the welding vent holes with tape, pull out the Xtracycle-provided tubing plugs and pour your rustproofing inside, allowing it to coat the insides of the tubes. Pour out the excess, let it “cure” for a day or two and get ready to build. First step in the build is to remove the saddle and seatpost, rear wheel, chain, rear brakes and rear derailleur from the “donor” bike. 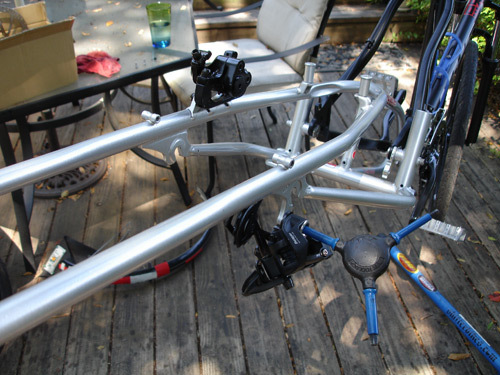 Flip the remainder of the donor bike upside down, resting the handlebars and the top of the seatpost on the ground. Trust me, this is the most convenient way to continue with the assembly as the Xtracycle’s “FreeRadical” frame gets bolted on. Rear brake body and rear derailleur removed from the donor. Next, thread the long bolts and “special nuts” into the receiving holes on the front of the FreeRadical frame. Xtracycle provides spacer washers to use if the donor bike’s rear dropout thickness is less than 7mm, but I didn’t need to use them…the donor KHS Alite 1000 has really thick dropouts. Squeezing the bike’s dropouts together, carefully seat the “special nuts” into the dropouts and screw in the long bolts (leave them loose for now). In the below photo, you’ll be able to see how this is all oriented — arrows point to the T-shaped stainless steel “special nuts”. 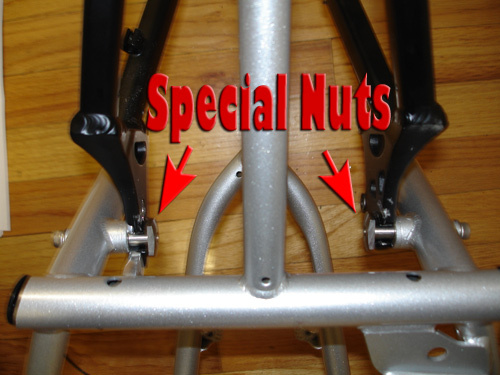 Now go to the special nuts and bike’s dropouts and snug those bolts up. 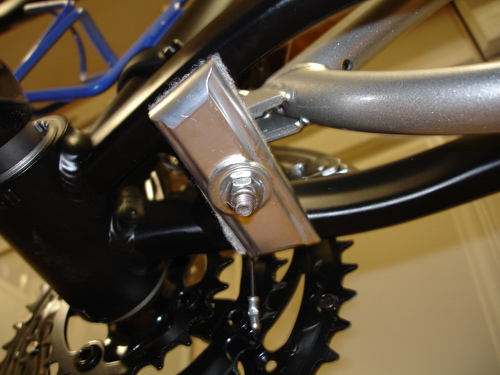 Xtracycle provides torque values for both sets of bolts in their instruction manual. You may need to hold the T-shaped portion of the special nuts with an adjustable wrench to keep them from rotating while you tighten the bolts with your allen wrench. The last step for this part of the build process is to place the rear wheel into the dropouts welded to the FreeRadical frame. Now we can roll this beauty outside and can complete the build outdoors with the assembly firmly grasped by a bike repair stand. Ok, take a break; you’ve earned a cold drink — and just as the instruction manual states, we’re over halfway there! Tune in next Tuesday when we complete the build…bolting on a new brake disc, the rear brake body and rear derailleur and running new cables and casings. Finally, we’ll put the V-racks and Snapdeck on, stuff the Footsies in their receiving holes and take this baby for a spin! My wife is pretty cool about me riding a bike to work, although sometimes I think that she doesn’t quite understand why I do it. My girls were at Grandma’s this weekend so we took advantage of it to do some errands by bike. Our dog needed some food so we went to our local Petsmart to fill up her pantry. I can’t stress enough how useful the Xtracycle Freeradical is, I’m really loving it. My wife and I had a great time riding our bikes to the market, she felt really good about leaving the car at home and getting some riding time on her bike. I think she now understands my passion for riding to work and using a bike for utilitarian purposes. So how does your significant other feel about you being a Bike Commuter? 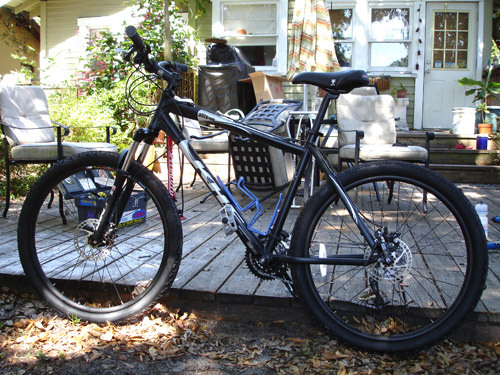 In case you missed it, I was the lucky winner of an Xtracycle Freeradical. I won the Xtracycle Freeradical at the Urban Bicycle Commuter Expo, I’ve never won anything useful in my life, but this is the BIG exception. I installed the Xtracycle Freeradical on my DiamondBack Transporter, the name just says it all. Today I had the chance to go grocery shopping, so I took the Transporter on its maiden voyage. As I pulled into the driveway, I felt the stares right away. An older fellow approached me and marveled at my bike. He then went to tell me his story about being a paperboy and using a bike to distribute the newspapers. I’ve ridden RL’s Xtracycle before, so I knew what to expect in terms of handling and how to balance a load. I’m really stoked about my new grocery gitter, I’m looking forward to personalizing it. Stay tuned for more Xtracycleness, we have more exciting stuff coming up soon.